Matthew Loper of Grandview, Indiana, at left, and Sam Dunning of Benton, Kentucky, work on sculptures. 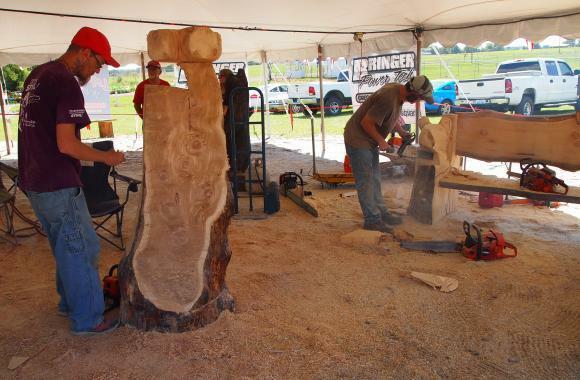 At the Adams (Illinois) County Fair at the end of July, a group of carvers brought their saws and their ear plugs to compete in chainsaw carving competition. Each artist turned a block of wood into a sculpture – an animal, a wizard, a dragon – and the artist whose work brought in the most money at auction was declared the winner. Songer demonstrated her sculpting skills at the fair with her husband, Stevie. She said they’ve been carving for 16 years. The Songers were joined by eight other members of LogHoggers, a group of chainsaw sculptors, who call their work “high performance art.” Formed in 1995, the LogHoggers is owned by R.D. Coonrod of Quincy, Illinois. He said the craft has evolved over the years. The wood carvings created during the week-long exhibit at the county fair depicted bears, owls, flowers, and more. Some of the pieces stood about a foot tall, others at least six-feet tall. Some of the art was functional, such as benches and mini-bars, while others were purely decorative. Matthew Loper said catalpa is soft but durable. It’s easier to carve soft woods, he said, and less painful.